The implosion of the Italian sovereign bond market, the world’s 3rd largest bond market, surprised the world May 29, 2018 with unexpected ferocity. However, long term readers of this publication need not have been surprised as we have been writing about an unfolding European sovereign debt crisis for more than four years now. If there is a surprise, frankly, it is in the seemingly glacial pace of events from May 2014’s first expression of political discontent in Greece to Monday’s full bloom of populist anger in Italy. The extreme scope and pace of the May 29th move testify against those whose counsel is to ignore these developments. We believe in seeking the truth, no matter how painful that truth may be, and find many reasons to pay close attention to Italy. We believe that our portfolios are appropriately defensive, to guard against the alarming developments that we explain below. I was fortunate to work with a group of brilliant, insightful people in the run up to what came to be known as the Global Financial Crisis. A handful of them were researching this seemingly obscure corner of the credit markets called “subprime mortgages.” They were convinced that these securities were wildly misunderstood and overvalued. If their view was right and these securities started to fall in value – wildly negative outcomes could follow. I found this fascinating and learned all I could. At first, I didn’t know anything about subprime mortgages. I did know something, however, about cycles and change and the power of the unexpected. I had seen firsthand the power of the bull market that began in earnest in 2002 in commodities and emerging markets and how the most powerful trends could start small and grow to dominate the world. I knew how hard it was to think expansively enough at the quiet start of a trend, how difficult it was for the human mind to encompass a future that was radically different from the past. So, I prepared myself by thinking expansively about how much the world could change. Part of my preparation was reading thousands of pages on the history of financial crises. That was the historical and fact-driven part of the analysis. But I did not want to limit my thinking to only what had happened, I wanted to be open minded about what could happen. So, I explored what the world of fiction had to offer and surveyed dystopian film and literature. That’s how I came across the 1968 version of “Planet of the Apes” starring Charlton Heston. I mean really, what could be more dystopian than a world where the apes are in charge, lording it over the humans, who are huddled and powerless? What really got me was the ending (spoilers ahead!). Charlton Heston’s character, the astronaut Taylor, believes himself stranded on an alien planet and is seeking answers for what happened to bring the planet’s humans so low. As he searches “The Forbidden Zone” for the truth, he is shaken to the core by what he finds. The final scene is at the clip below. Taylor comes across the Statue of Liberty, broken and half-sunken, on an abandoned rocky beach. He is on Earth, not on some faraway planet. I didn’t see that one coming! Nearly twenty years of professional investing experience has taught me the imperative of embracing change. For this to be profitable, it must be done early. Identifying a trend early buys you the time you need to study it and fully understand it. One trend we have studied for years leapt from the back page onto the front page yesterday, the meltdown in the Italian sovereign bond market. Since May of 2014 we have been writing about the risk of a European sovereign debt crisis, and the rise of populism making it more likely. You can find the entirety of my published work by sending us an email here. 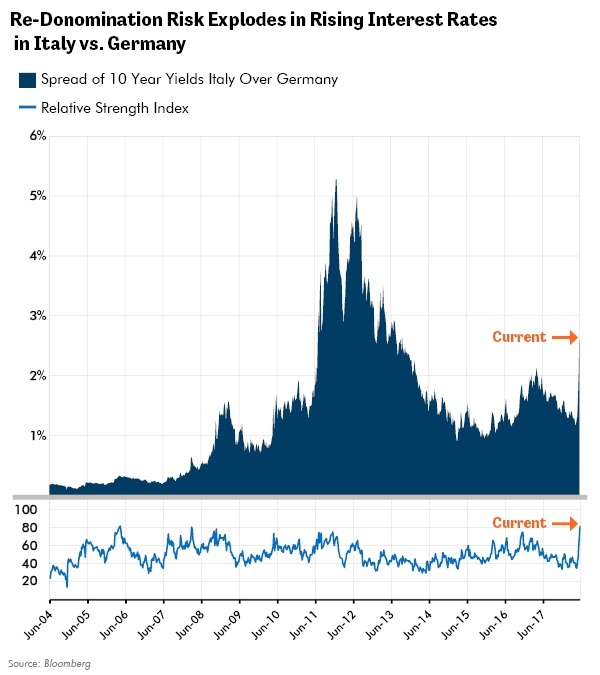 The chart below shows the almost unprecedented scope and pace of damage in the “yield spread” or the premium the market demands to fund Italy’s 10-year bonds over the yields of German bonds. The worst thing about this development, is that it raises the specter of an even bigger risk: re-denomination. This risk can move global markets and is one key reason you should care about what happens in Italy. The shock of the move above was enough to cause yesterday’s huge rally in the U.S. Treasury bond market and the near 500-point intraday decline in the Dow Jones Industrial Average. The market is saying that these events are important, and I think it’s right. This potential for re-denomination is the worst flaw at the heart of the Euro’s currency system. Sovereign nations such as Italy are borrowing money in a currency that is not theirs. The Euro is a currency that Italy does not manage and cannot create at will. Only a supportive political consensus in Italy keeps this system going. This means that Italy has made a political decision to adopt the Euro as an effective currency “peg.” That which was pegged by politics can also be de-pegged by politics. This is the problem with which markets are now wrestling. Reflexive trends are rare but powerful. They can take events that normally have low odds and raise them dramatically. Reflexive events can drive dramatic change from seemingly less significant events. Political turmoil in Italy making re-denomination more likely. I am in complete agreement with Warren Buffett that derivatives are “financial weapons of mass destruction.” These reflexive risks lurk in the literally hundreds of trillions (trillion with a T) of dollars of “side bets” among banks. The six weeks following the failure of Lehman gave a taste of what markets looked like when a “too-big-to-fail” derivative player went bankrupt. Redenomination risks raise questions that are hard to answer. What would it mean if Italy, the world’s third largest sovereign bond market, redenominated its debts, such as if Italy left the Euro and went back to the Lira? Who would true up any shortfalls between the Euro or dollar value of derivative contracts and the new, likely highly devalued Lira, that would be available to Italy’s banks? The state of Italy would likely be unable to do so, nor would its banks. Who would ride to the rescue? For the last ten years and longer the answer has been central banks such as the Federal Reserve in the US or the European Central Bank in Europe. Therein lies the problem. This is new. Central banks are stepping back. The soothing blanket of literally trillions of dollars of asset purchases by these central banks has created and sustained this latest market cycle in our overindebted world. How will the markets respond when the “central bank put” is not present? Central Bankers had Promised to Do Whatever it Took. Is that Still True if They Don’t Like Italy’s Politics? Mario Draghi in July of 2012 drew an end to the raging wildfire that was an unfolding European sovereign debt crisis. He stabilized entire European bond markets by promising to “do whatever it takes” to guarantee Eurozone stability. Literally overnight credit stress in the Eurozone vanished. Yet a serpent has entered this central bank guaranteed paradise: the disagreeable politics of the elected officials of the sovereign Italian people. This is a new problem. Past interventions took place only after problem countries submitted to the yoke of their creditors. Will Italy be willing to do so? Recent political events suggest the answer might be no. With the failure of the Italian bond market, the market is wrestling with an emerging but I believe even more powerful narrative, one that I have been expecting for almost four years now: the hegemony of the ballot box. Are voters more powerful than central bankers? I think the answer is yes. Consensus Opinion says that Italy Doesn’t Matter. Don’t Believe It. Should we listen to the Talking Heads on CNBC who are telling you not to care about events in Italy? I find their views of no value. I don’t remember any of them seeing the risks in Italy coming. Why should I listen to them now? What I do find valuable, is the opinion of the credit default swap (CDS) market. This market proved to be the most insightful in the earliest days of the financial crisis and is flashing real concern now. 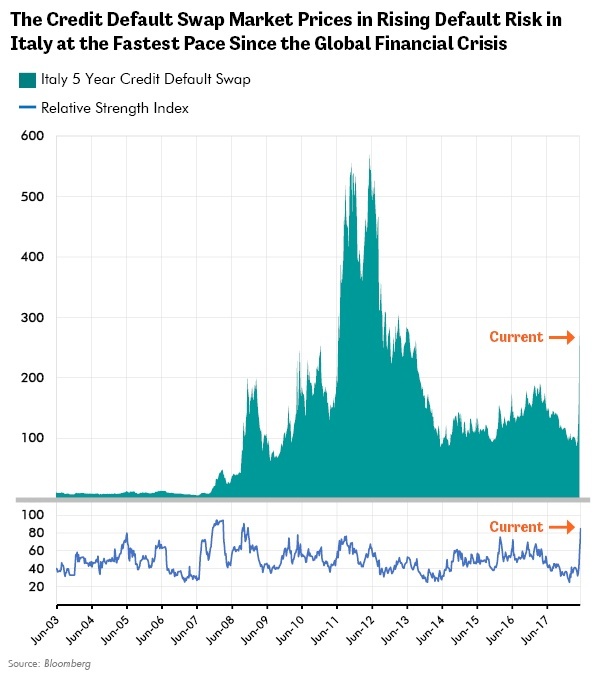 The CDS market’s estimate of default in the Italian sovereign debt market have tripled in a month, as the chart below displays. My own opinion is that its unwise to ignore the fastest and strongest rise in default risk in the world’s 3rd largest sovereign bond market since the financial crisis. After all, I have seen the value of understanding powerful new trends in their birth. Are we seeing that again now in Italy? Only time will tell. Knowledge is power. But still I would be lying if I said that my study of these matters has brought me peace. Like Taylor in “Planet of the Apes,” I have sought the truth. As Dr. Zaius promised, however, I don’t like what I found. The Eurozone project, with the Euro as its ultimate creation, was a grand human design constructed to solve the worthy and intractable problem of endless internecine warfare on the Continent. Recent events in Italy show that the engines that we, the victors of World War II, built to stabilize the world, that powered so much peace and prosperity, are sputtering one by one into silence. Rising CDS in Italy are only the latest expression of this. Once dead, who will coax them into life again? "All my life I have awaited your coming and dreaded it, like death itself." "The Forbidden Zone was once a paradise; your breed made a desert of it…"
“Taylor: There’s got to be an answer to it [to how humans fell beneath the apes].